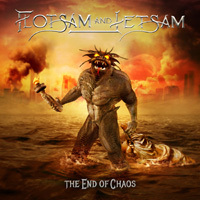 Formed by guitarist and vocalist Matthias Weiner in 2012, Powergame flys the flag of the New Wave of Traditional Heavy Metal in the best German tradition. The band dropped a demo in 2013, Raw Heavy Metal and their debut long player, Beast On The Attack in 2015. Now the foursome returns with their second effort, Masquerade for Germany's Iron Shield Records. There's little doubt, Powergame is channeling the icons of the New Wave Of British Heavy Metal. The band got their name from a Tokyo Blade song and cite Samson, Raven, Angel Witch, Demon, and Iron Maiden, among others, as musical influences. 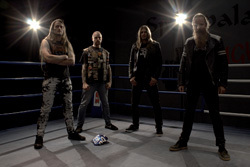 Additionally, in their music, Powergame has all the elements of traditional heavy metal: twin guitar harmony and leads, a strong and galloping rhythm section, and clean classic heavy metal vocals. All these things are wrapped in melody, harmony, and rock groove. If anything, Powergame's strength is definitely in their twin guitar power. In the end, Powergame knows their metal genre and executes it quite well. As for the songs, many if not most have the gallop of power metal. You'll feel the need for speed with Legion Of The Dead, Powergame, Masquerade, and Baptized In Fire And Steel, which has a strong bass line. Within Ghost Town, the guitar lines are sharp and distinct at the start and continue to power the song throughout. In the middle of the album you'll find a heavy, guitar-driven instrumental. At the end, Powergame offers a satisfying cover of Scorpions' Blackout. 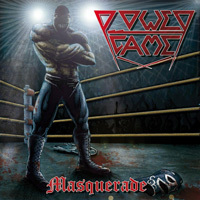 All in all, with Masquerade, Powergame delivers some strong and entertaining traditional heavy metal with plenty of twin guitar fury. Recommended. All in all, with Masquerade, Powergame delivers some strong and entertaining classic and traditional heavy metal with plenty of twin guitar fury. Recommended.